The Rose side of the family just got back from a fun & relaxing week in Florida. Our destination was Treasure Island -- a beachfront community just west of St. Petersburg. Yes, technically, it's an island because it's separated from the main land by an inner-coastal waterway, but a series of very short causeways and drawbridges makes it so it doesn't "feel" like an island. According to Wikipedia, "Treasure Island got its name after several property owners attempted to boost sales of the properties being developed on the island by first burying and then pretending to discover a couple of wooden chests on the beach around 1915. After claiming the chests were filled with treasure, the news of the 'discovery' quickly spread and people began calling the island Treasure Island." We left the DSM airport on the morning of Monday, August 5th along with my Mom & Dad. (We would meet my sister and her family there). I would like to pause for just a moment to say that I'm very thankful that Allegiant Airlines decided to come to Des Moines a few years ago. Sure, they are a low- budget, no frills airline, and you have to pay for even the smallest niceties (carry on luggage, snacks, etc.) 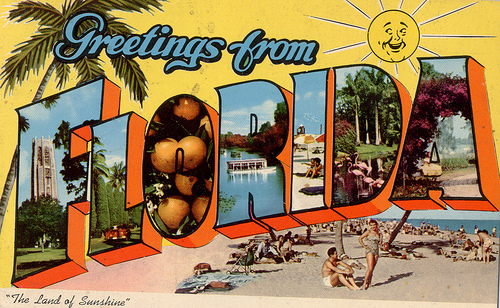 but the important thing is that they offer direct flights to a couple cities in Florida. When traveling with kids, a non-stop flight is 5 times better than something with a layover (maybe more than 5 times)! You don't have to spend a "whole day" traveling. Even though Allegiant does fly into St. Petersburg, they didn't have a flight that day that worked for all of us, so we flew into Sanford... a nice, small airport (similar to DSM) on the north edge of the Orlando area. We got a rental van and drove about 2 hrs. and 20 minutes to our destination. (I would still rather fly once and drive 2-3 hours than have a layover.) 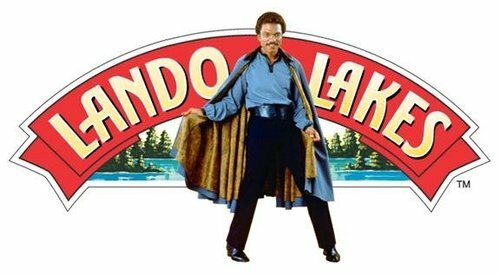 Although we didn't stop there, we drove right through the town of "Land O' Lakes" -- I think the town is missing out on some great name-related advertising tie ins. Our hotel was "Sunset Vistas Beachfront Suites" -- as the name says, right on the beach (see reviews here). Every room is a 2-bedroom suite. Even though we were on the north side (ocean is on the west, of course), the rooms are angled so that you still get a fairly good view of the ocean. The hotel staff was very nice, and arranged to have our rooms fairly close together. It wasn't luxurious, but was clean, accommodating, and had everything we needed. We had a small leak in one of the bathroom pipes, so a maintenance guy came to fix it part way through the week. He told me that the building was only 7 or 8 years old, and it did in fact seem rather modern. The pool wasn't fancy, but big enough to have fun, and there was a small kiddie pool. I would give it 3 1/2 stars and cheerfully recommend it. The whole town seemed more family oriented that the Daytona Beach area (where we were at 2 years ago), and less of a "party atmosphere." - At the beginning of the week, I told Ben & Joe that when digging a hole in the sand, it's a good idea to dig down deep enough to get to standing water. For the rest of the week, they called it "standard water." - Both boys were hesitant of going in the ocean at the beginning of our week, but had warmed up by the end, especially Ben. On our last day, he and I spent about 40 minutes bobbing in the sea right at sunset. They still liked the pool better. - Florida seems to have a much higher proportion of rude/selfish drivers than Iowa! Not necessarily bad drivers, so much, but just a "I'm in a hurry so I'm going to merge 1/4 inch in front of you" attitude. - Customer service in the south is different that what I perceive it "should be." Servers, cashiers, etc. seem to think that being friendly and chatting is more important than either speed or accuracy. - Combining our prior Florida vacation and this one (the last was 2011, we weren't able to go in 2012), I finished one of my Star Wars books, "Planet of Twilight." (Yes, It took me two vacations to finish one book. I'm a slow reader, plus it was usually only a few minutes each day of actual reading.) I was pleasantly surprised; it was a decent book after a below average previous book by the same author ("Children of the Jedi"). - When we flew on the airplane for the first flight, Joe wanted the window shade down at takeoff, so he wouldn't see the "fire that would blast out of the engine." (I think he envisioned takeoff more like a space shuttle) Before the flight home, we explained that there is no fire involved (ideally), and then he really enjoyed watching the takeoff! It was also kind of cute that they both said, "touchdown!" when we landed both times, unprompted. - Our flight home was very early, so factoring in driving and enough time to arrive in advance, we had to wake up about 3:00 AM. We were back in DSM before 11, ate, and took naps - all 4 of us! It was very little sleep, but one nice aspect was that we had the whole rest of the day to recover & allow Debbi to prepare for childcare kids coming the following day. Also, my current work schedule has me coming in to work a late half day on Tuesdays, so I was able to use Tuesday AM to catch up on some work around the house. - I got to watch several episodes of "Pawn Stars" and "American Pickers" -- two shows I rather enjoy but don't get to watch much (we don't have cable or satellite at home). It was also a good time with the family all around, just a time to relax and fellowship. I think this picture should be on a postcard! because the lens was foggy from the humidity.